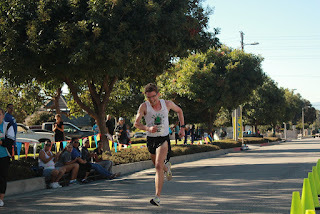 Despite running up to 130 miles per week at one point in my running career, I have been lucky to have never had an adductor strain (*knock on wood*). That being said, this is a muscle group that is often neglected and shut down by many fitness professionals as just being overly "tight". Most typical medical or fitness professionals will tell you to stretch these muscles as you are "overusing" them. That may be true in some cases, but what I tend to see is similar to what I see with the hip abductors: WEAKNESS. Muscle that are either overworked OR weak are prone to tightness. What I have discovered in my short time as a licensed DPT is that while the hip abductors and glutes are important, you must also balance the body. So if you strengthen your abductors and they are firing right, get those adductors going too! So let's jump into this. There are several muscles that adduct the hip and they do some other pretty cool things. The major muscles I want to focus on are the adductor brevis, longus and magnus. 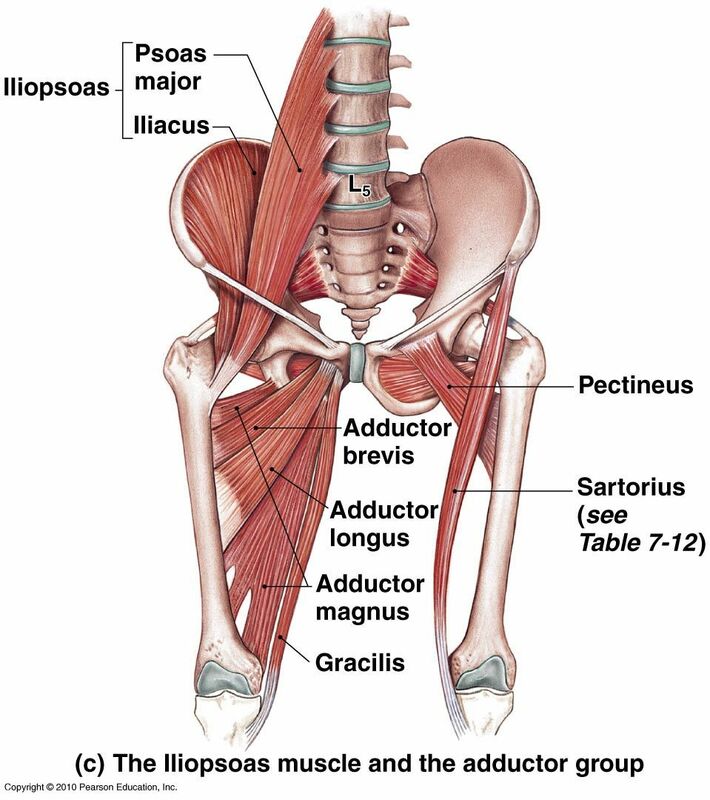 The pectineus and gracilis are also adductors of the hip, however they too have multiple functions. The pectineus is actually more of a hip flexor (additionally emphasized by its innervation by the femoral nerve) but it still a hip adductor. The gracilis is a multifunctional muscle that not only adducts and flexes the hip, but also serves to assist with knee flexion. The gracilis, being a very long and slim muscle, is not a great power generator and thus can be put at risk if other larger muscles around it are weak. Besides simply adducting the hip (bringing the femur toward midline or medial), the adductor muscles themselves also do a variety of things that change depending on whether the hip is in neutral, flexion or extension. The adductor brevis mostly does hip adduction, but also can internally or externally rotate the thigh depending on the position of the femur. Although to be fair, all the adductors can contribute to external or internal rotation depending on the position of the hip joint. The adductor longus is a major adductor, but also an interesting muscle in that it is also a flexor or extensor of the hip depending on position of the hip. If the femur is in flexion, the adductor longus serves as a hip extensor. If the femur is in extension, the adductor longus serves as a hip flexor. This is a muscle that needs to work well as an assistor to other muscles. 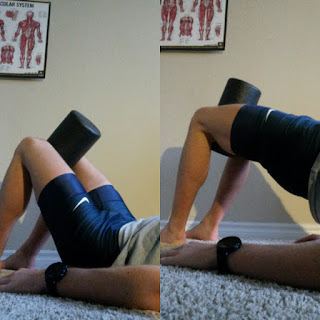 When the major hip flexors and/or hip extensors are weak, the adductor longus can be commonly overworked and injured (particularly in long distance runners). This is because the adductors are primary hip adductors of the hip and secondary muscles with extension, flexion and transverse plan motion. So they should NOT have to take over the job of primary muscles. When the primary flexors (psoas/iliacus/rectus femoris) or primary extensors (glute max, hamstrings) of the hip are weak, the adductors are in good position to compensate. Now if the adductor longus is weak, runners may have difficulty swinging that leg faster (cadence anyone?) because they will have less control at end range sagittal plane motions. 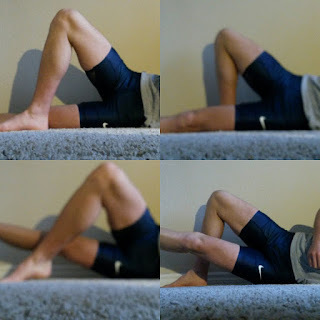 While the larger muscles flex and extend the femur, the assistance of the adductor longus can help move that leg faster, especially during flexion to help get that femur back up high enough so the runner strides forward from the hip and not with the feet aka overstriding. As I mentioned earlier, the adductors help with extension when the hip is in maximal flexion and flexion when the hip is in maximal extension. They assist those primary muscles when they are at end range to protect them and assist them with maximal force production. On a side note, per Neumann (2010), the adductors only really assist in the sagittal plane (flexion/extension) outside of 40-70 degrees of hip flexion. Within that 40-70 degrees, they line up best in the frontal plane and work as pure adductors best. Moving on to my favorite, we have the adductor magnus. This huge and thick muscle is big enough that it has two separate nerve branches. Both the obturator (major nerve to the adductor muscle group) and tibial (nerve that mostly innervates the hamstring muscles) nerves provide innervation for this muscle because it does so many things with a great deal of force. This is the power muscle of the adductor group. Like the addutor longus, the adductor mangus also adducts, extends the hip. However, the adductor magnus is strong enough that it is considered (per Neumann) as a primary hip extensor as well as primary adductor. As there are two separate innervations of the muscles, there are two components. The adductor section both adducts and flexes the hip, while the hamstring portion assists the glutes and hamstrings in extending the hip. Unlike the hamstrings however, the adductor magnus is a broad and thick muscle that only crosses the hip joint, unlike the long and comparatively thin biceps femoris, semitendinosus and semimembrinosus which all cross both the hip and knee. Thus it is much better equipped to be a power muscle as a major agonist to the glute muscles with hip extension. The adductor magnus and gluteus maximus are major hip extensor agonists and while they are antagonists for frontal plane movement (not completely true as the inferior portion of the gluteus maximus is actually an adductor....), balancing them for sagittal plane movement may be one of the keys to producing a great deal of force from the hip during the mid/terminal/propulsive phase of running (among many other components. There are no shortcuts). To summarize, the hip adductors can do most of the motions related to the hip (abduction being the exception), are primarily adductors, but assist the primary sagittal plane motion muscles (extensors and flexors of the hip) in producing force. Certain ones are even primary contributors to sagittal plane motions (adductor magnus). Another major function of the adductor muscle group that seems to be overlooked is stabilization of the pelvis. In addition to strengthening the gluteal muscles for strength and loading, for my patients with pelvic/innominate instability, asymmetries, etc, adductor strengthening has been one of the (many) keys to keeping that pelvis stable and in place. So like the glutes and hip abductors, the adductors are both stabilizers and movers. Thus it is important to have them strong to balance out not only the pelvis but the whole body. So what are some of my favorite exercises for the adductors? Before we start, make sure you are also working those hip abductors (glute maximus, medius, minimus and TFL as needed) because we don't want only certain muscles strong. We want all of them strong and balanced. So here are my starters. A ball, foam roller or other compressible object can be used to emphasize the hip adductors. This motion will also emphasize the lower fibers of the gluteus maximus as they also contribute to hip adduction. Most of the time I start out weak patients with a simply putting a ball or towel between their legs in supine and having them adduct/squeeze they legs together. That's fine to start, but for someone I'm trying to push a bit more? Doing bridges with an adduction component is a great way to pull in the adductor magnus as this is an extension based exercise. Make sure you hold the squeeze through the entire motion. Technically this will also pull your adductor longus in as well since you are extending the hips starting from a flexed position. 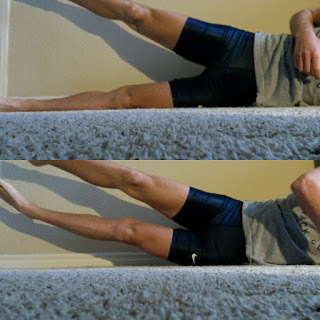 A classic hip adductor exercise (and also how you perform the manual muscle test). 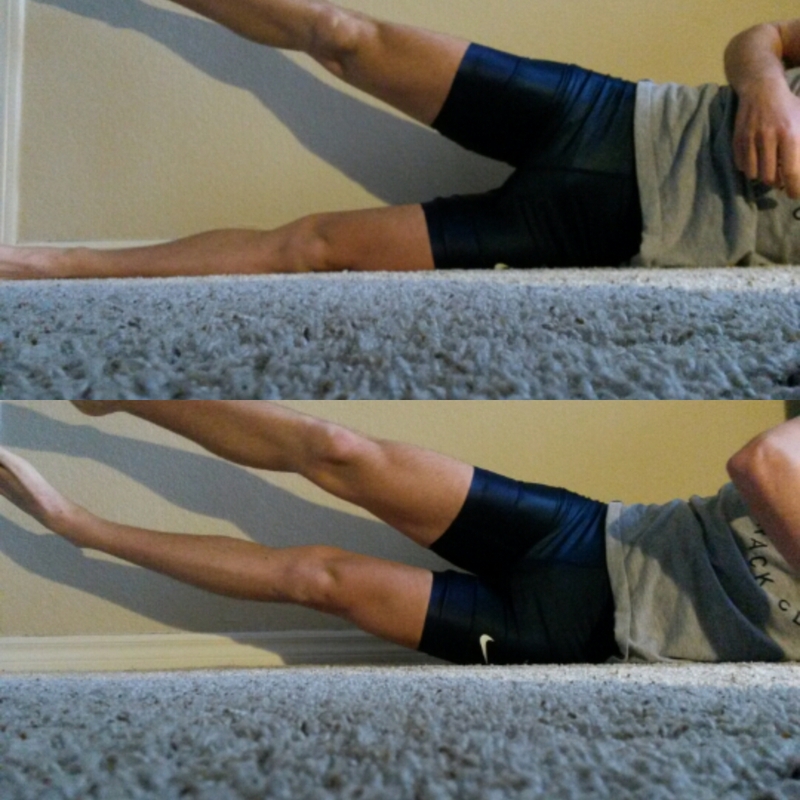 Lie on your side, keep your trunk and pelvis stable and lift the bottom leg up. If you hold the top leg up while you do this you will get a great hip abductor isometric workout at the same time. My variations for this to effectively target the adductor longus and magnus are to do this in a flexed, neutral and extended hip position. Want to make this harder? Use leg weights or even do this with a pillow or ball between your legs. Variations you can use to emphasize the flexion or extension qualities of the adductors. 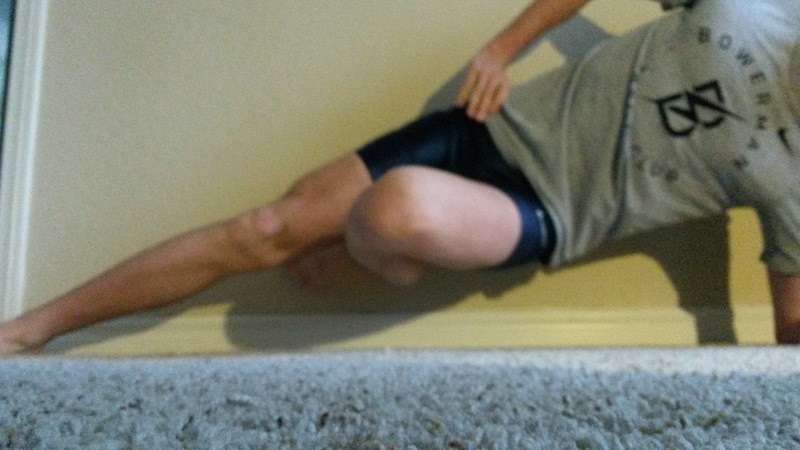 A challenging isometric hip adductor exercise. Advanced pelvic stabilization. This is an intense adductor isometric workout and should be balanced with normal planks to also hit the hip abductors. Start in the plank position but remove your bottom leg and hold. Make sure you keep your trunk and legs straight and don't sag toward the ground. Want to make this harder? Drop your hip down, return back up and repeat to make this a challenging close chain hip adductor workout. These are just a few of the many exercises I use for both myself and my patients. I again want to emphasize that everyone should focus on strengthening everything. Having a strong and balanced body is one of the many keys to both injury prevention and performance. There aren't really any shortcuts to improving performance. Good nutrition, good hard training, adequate rest, and balanced strength. Muscle imbalances are what can (among many things) cause problems. So with this make sure you work your hip abductors too (see my previous post on this HERE). Guess who also needs to work on core, adductors, abductors and pelvic stabilization? As always, my views are my own. My blog should not and does not serve as a replacement for seeking professional medical care. I have not evaluated you in person, am not aware of your injury history and personal biomechanics, thus am not responsible for any injury that you may incur from the performance of the above. I have not prescribed any of the above exercises to you and thus again am not responsible for any injury that may occur from the performance of the above. This blog is meant for educational purposes only. If you are currently injured or concerned about an injury, please see your local physical therapist.